Free online quaddragon curve generator. Just press a button and you'll get a quaddragon fractal. There are no ads, popups or nonsense, just an awesome four dragons fractal generator. Press a button – get four dragons. Created by mathematicians for mathematicians. Iterations Amount of iterations; number of steps to generate the curve. If you set amount of iterations to a big number, then they will fill the dragons completely with a solid color. 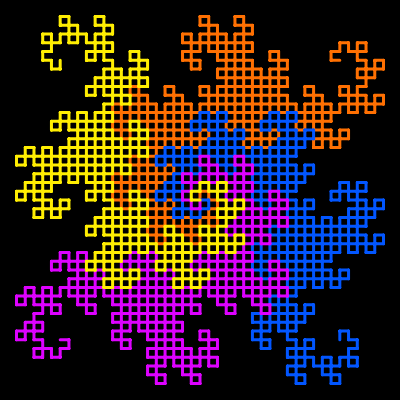 Background Background color of the quaddragon curve. Dragon 1 color Color for the first dragon. Dragon 2 color Color for the second dragon. Dragon 3 color Color for the third dragon. Dragon 4 color Color for the fourth dragon. Line Width Quaddragon line thickness. Padding Clearing area around dragons. Select Direction Turn the dragons this way. Quaddragon curve generator tool What is a quaddragon curve generator? 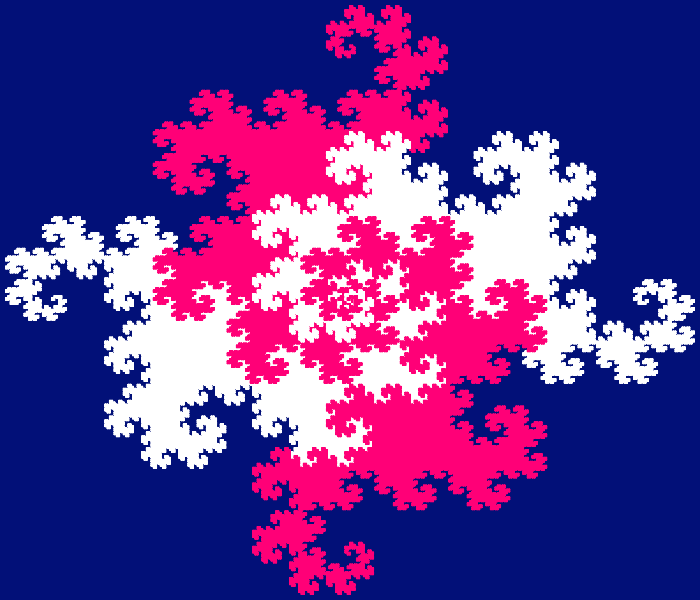 This tool draws a quaddragon curve. The quaddragon fractal, also known as four dragons fractal, consists of four regular dragon curves. All dragons originate from one point in the center of canvas and each dragon is rotated by 90 degrees. Dragons twist in clockwise direction and they perfectly fit next to each other. You can customize the drawing line's thickness and color for each individual dragon as well as adjust the background color of the image. You can also change the number of recursions to evolve dragons for, adjust padding around dragon tails and image border, and adjust the starting drawing direction (right, left, up down). Mathabulous! This example draws four colorful dragons in red, green, blue, yellow on a square canvas of size 400 by 400 pixels. We use 9 iterations, 15 pixels of padding, and because we use a thin, 3-pixel drawing line, dragon drawing paths are clearly visible as they consist of line segments. This example uses only two colors for four dragons. It sets dragons one and three and two and four (opposing dragons) to use the same color. This makes the dragons twist, turn and mix together. It's generated using 14 recursions on a rectangular frame sized 700x600px. In this example we use four different tones of blue color for each of the dragons. Combining it with black background color creates an amazing fractal. 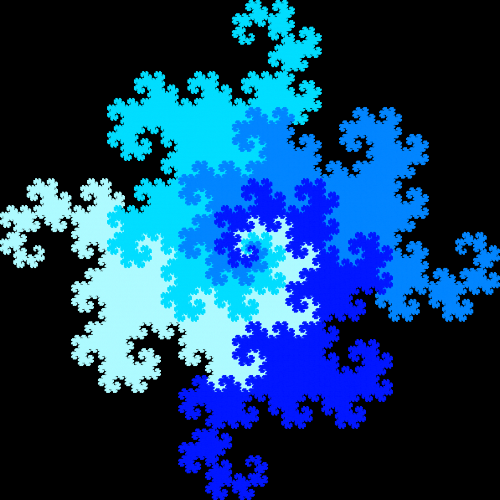 We're using 16 steps to generate the quaddragon curve. There are so many line segments and they are so close together that a line with width of 1px is enough to fill all dragons with a solid color.